I spent one long, cold year living in Minnesota, where the locals joke that there are only two seasons: Winter and Road Construction. Lately, I’ve been feeling like the same could be said here in Seattle, especially when I try to navigate 45th Street (which, like any good Wallingfordian, I avoid as often as possible). To find out the purpose of the construction on 45th, I contacted SDOT’s Jeff Bender, who helpfully explained the project. The construction along 45th is part of transit improvements to create a bus corridor along 45th/46th/Market. This should make trips along the route faster, buses more frequent, and allow buses to be more timely. All good news since taking the 44 from the U-District can be a major pain, especially at rush hour. Add fiber communications and new traffic signal equipment to give buses priority treatment at key intersections. A “queue jump” allows buses to go the front of an intersection in their own lane (on the right). The buses get early green signal so they can start before other vehicles. You can see a queue jump in action as you approach the Montlake Bridge, where the right lane (for buses and carpools) gets a green arrow sooner than the rest of traffic. At the Midvale intersection, only the bus will get that privilege. “Bus bulbs” are sidewalks extensions that allow buses to load and unload passengers without having to pull into and out of traffic. This hastens the loading and unloading process for the bus. Bus bulbs also offer such passenger amenities as shelters, benches, trash bins, pedestrian lighting and where possible, street trees. Or, if you are in Paris, coffee and a lending library. In Copenhagen, a skateboard ramp (see #17). And in my husband’s beloved Minnesota, heat. “Fiber communications” will allow buses to trigger the signal and receive priority along a transit corridor. You can already see this in place along the Third Avenue transit corridor. In the future, these fiber communications will also allow for the installation of digital signs that can tell you how long you must wait until the next bus arrives. Woo hoo! The improvements are made possible by the “Bridging the Gap” levy, which was passed in 2006. If you’re interested in transit friendly design guidelines, I recommend this SDOT document as a great intro to creating livable, walkable, busable cities. This is great news. The 44 is one of Metro’s most well-used routes, so it is well worth investing in. Thanks for the info, Wallyhood. Much appreciated. 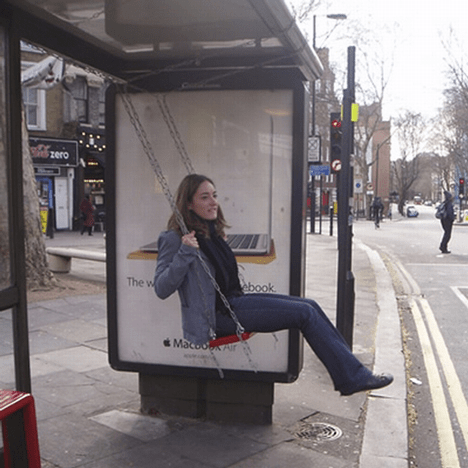 Which bus stop has the swing? @Sharon, that one’s in London. As far as I can tell, none of the fun ones are here in Seattle (yet)! Thanks for finding the definitions to the “Bus-Speak” that was all over the project’s website. I sent a note to Maribel Cruz and got some of the same definitions. It is too bad they can’t just ‘splain it so the average non-transit geek would understand in the project page on SDOT’s website. If anyone wants to be added to SDOT’s mailing list about this project, just send a note to: Cruz, Maribel , though Kimberly’s article covers the project very well. I’m liking the new lighting they’re installing as part of the bus bulb projects. Nice design and function. I imagine folks will feel safer and be more visible to bus drivers with the lower level lighting. Hope the system works to improve traffic flow. The project itself was the messiest I have ever observed in Seattle. However, the paving on Northgate is rivalling that assessment. I also hope this will improve reliability on the 44. Definitely an important route and one than is too often subject to the impacts of the traffic on 45th, to the frustration of many riders who depend upon it. While the transit improvements are nice, for us who live close to 50th, could you take back your car traffic? 50th is now a mess with traffic from 45th so people are now cutting through on 56th down to greenlake to avoid the traffic on 45th and 50th. They fly through the neighbor and side streets at 35 mph and then continue on their way to points west. The purpose of “bus bulbs” is to frustrate drivers. In this case, they will send more cars across the greenway. Brilliant. The bus bulbs are in my opinion a horrible idea. While this will likely improve bus traffic on 45th it is sure to worsen car traffic. Bus bulbs mean that as the passengers enter and exit the bus everyone has to wait (including any busses stuck further back) instead of being able to go around the (very slow) bus. If you are unlucky enough to be behind a bus at a bus bulb while it’s (un)loading a handicapped person the wait is even longer. And, since the bus bulbs are all along the single lane corridor now you will NEVER be able to get around the bus until your route diverges from the bus, thus encouraging drivers to cut through the neighborhood side streets. It would be much better to allow cars to pass the bus when the bus is stopped. I think the issue they are trying to solve is to allow buses an easy way to merge back into traffic when they are done at the stop. If this is the case there are other ways to do this (driver education, special stop lights at bus stops, etc). It’s been the law for years that drivers must yield to transit buses trying to reenter the traffic flow (RCW 46.61.220). People just don’t do it, sadly. the bus bulbs are designed to make car drivers mad and to stop everyone while one last bus passenger dangerously jogs across the street and catching breath stumbles along wavign frantically to the bus to STOp for their very important appointment .. have you ever counted how many cars get stuck bus loading with this bright idea? My favorite part is how is removes parking spaces, so fewer people can shop in Wallingford. Great for local businesses and property values! /sarcasm. @Chris, the information I received from SDOT is that bus bulbs acutally increase the amount of parking availalbe. When the bus has to pull out of traffic, the space designated for the bus must include enough room for it to both pull completely out of the lane and then pull back into the lane (so it needs additional space to move forward). With the bus bulb, that “dead space” at the beginning and end of the bus lane are no longer necessary. Some parking around the bus bulbs may have been removed, but that was possibly to increase visiblity and may have been done even without the bus bulb improvements. Also, I don’t think that decreased parking necessarily corresponds to fewer people shopping in Wallingford. Increased foot traffic (which you can get from buses especially when they run reliably) will likely have a postive effect on our local businesses. When I am in my car, I also experience the frustration of being stuck behind the bus. However, as more apartments and condos are built in our neighborhood and population density continues to increase, I would hate to see the number of vehicles keeping pace. Talk about a traffic jam on 45th! One way to keep the number of cars down is to create a transit corridor. We have to think ahead a few years. If we don’t make transit improvements, we will just be complaining about the awful traffic on 45th and bitching that SDOT doesn’t do anything to make it better. More efficient bus service = More bus riders = Fewer cars on the road = Less traffic for those who chose to drive.